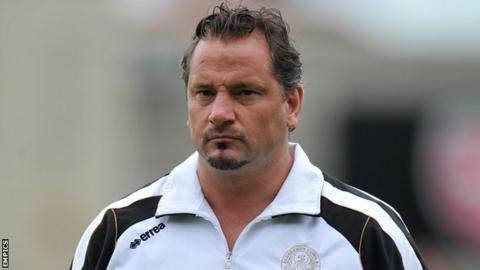 Aldershot Town manager Dean Holdsworth is remaining positive despite their poor start to the season. The Shots have only won two games and lie 20th in League Two. He told BBC Surrey: "It's how you react to it. We're positive and look forward. We have to roll our sleeves up and stick together. "We analyse the mistakes or goals against us and work on that. We give the players the belief our system works. We'll get through this period." He added: "With and without the ball, we've got to be able to educate the players. "You have to lift them up as well because it's important you go out there confident and not scared of anything." Fans booed the Shots following Saturday's home defeat by York City but Holdsworth insists he is not under pressure. "The pressure I feel is I want my players to perform and feel some joy in playing the game we do," he said. "The stats tell you that there is always pressure on managers. My pressure comes from me. "I analyse everything after the game. I look at myself, the staff and the players. "We got back from Torquay at two o'clock on Wednesday morning and I was up at six to watch the video. "That's what you have you do. You have to carry on working your socks off to educate yourself." Holdsworth is adamant he will be able to lift the club up the table with the squad at his disposal. "We'd love to have the money to get more and better players in," he continued. "We're a small club in this division who battle day-in, day-out. "I play a big role in this club and I love working here. We're a team and if we have to work even harder, we will. "I'm confident in this bunch. We'd love to have a bit more quality around the squad in terms of numbers. "The belief will come through and when it does, it will be a nice reminder to the people who want to knock us that we are a team who work really hard together."